This is the follow up book to How To Heal Yourself And Others Now. If you have taken a variety of healing modalities, and read various books on spiritual gifts and how to books on healing, this book is for you. If you are that person that always believed that there was a simpler way to change things in an instant, this book is for you. 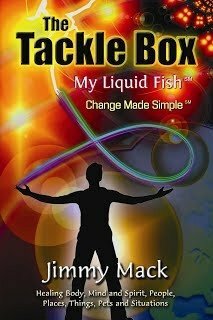 If you’re a client of mine who already knows how to “fish” but wants to become a “pro-fisherman” this book will give you the whole enchilada! Everything I explain and talk about in my one on one sessions is ALL in this book! “It’s all there, everything you do! Perfecto and thanks for sharing this with the UNIVERSE, and little ole’ ME! It doesn’t have to be so difficult, and those that are ready to embrace the fish and play and release will be quite happy with their lives.” ~ K.D. “What an awesome book! Practical, inspiring, & life-changing. Very uplifting. You make me feel like all my problems are nothing and life is magical lol. Blessings.” ~ I.S. “Just a note to let you know I’ve been playing with fishing for my daughter. She enjoyed her training in Charlotte, and passed with a 99%—tied as the highest score in the class! She didn’t have any anxiety attacks or worry about taking tests and reported that she was calm and understood and remembered what she learned!She said I can do VooDoo on her anytime! Yeah!! Now feeling more confidence to work on my little grand-daughter remotely. Thanks for what you teach!” ~ L.J.